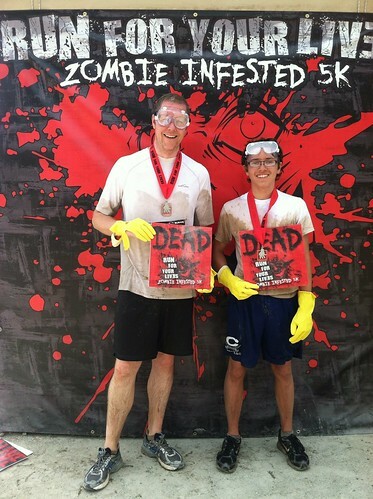 Jonah and I ran the 2012 Run For Your Lives zombie-infested 5k obstacle course yesterday. It was the most fun I’ve ever had running, hands down. Registration was handled just outside the large field. Each racer signed a waiver, and then obtained their racer packet with everything they needed. Each packet contained a technical shirt with the event logo, a timer chip, their number bib, and their health flags. 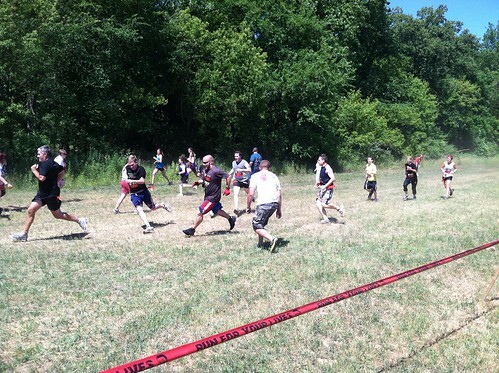 The race was run like a game of flag football: each racer wore a belt with three large red flags attached to it. Zombies would try to pull the flags off during the run. If you completed the race with at least one flag remaining, you survived. If you completed the race with no flags, you were an unfortunate victim. The only real difference is that the “dead” were not eligible to win time-based prizes. I had registered us for the noon wave, so we arrived just before 11 to ensure we could get checked in and then acquire a lay of the land. The pre-race area was a huge field. Along one side of the field were a couple of tents selling food and merchandise. Next to these was a large stage hosting a number of different live bands through the day. Along the far side of the field was a large bag check area, a tent for changing in privacy, a first aid tent, and a media tent. Next to these were a couple of tents from the primary sponsor for the day, Subaru USA. On the last side of the field were the race’s starting and ending locations. Adjacent to the latter was a “decontamination zone” in which muddied runners could wash off the grime. Small groups of people dotted the landscape – some fresh from running their wave, some yet to run, and some clearly there just to observe the spectacle. Most runners were wearing what you’d expect for a competitive run, but there were a lot of people wearing clever or ironic zombie-themed shirts. We saw a number of shirts with the rules from “Zombieland”, several varieties of “don’t eat me”, and a host of others. One group was dressed as super heros (Spider-Man, Superman, Batman and Robin), and another group was dressed as movie characters (Buzz Lightyear, a Ghostbuster). At least two different guys were dressed as Shaun from “Shaun of the Dead”. And there was one ninja wrapped head to toe in black. The Subaru sponsorship was pretty clever, I think. They were advertising “the official escape vehicle of the zombie apocalypse.” If you arrived in a Subaru vehicle you got to park for free. They were also running a “zombie revenge” game for people who had not yet run the race. You’d compete against another player to perform a couple of silly tasks: hurl stuffed zombies into an open grave, roll a tire through an obstacle course of upturned zombies hands presumably, and finally through a ball at a dunk tank to plunge a man in a zombie mask into the water. If you won, you’d get to replace one of your health ribbons with a special blue ribbon. If you completed the race with that blue ribbon you’d win a goodie bag. We later found out that the goodie bag contained seat covers. Clearly the folks at Subaru had put some thought into this. 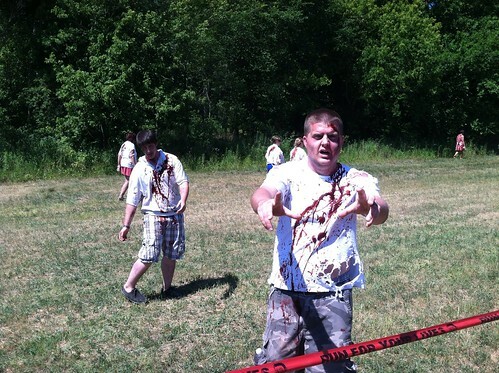 Between the Subaru tents and the race starting point was a large stretch of open space filled with shambling zombies. This was, in fact, a portion of the course, and was fenced off from the field. A considerable number of spectators stood along the fence watching the runners. This was, in fact, a thoroughly enjoyable thing to do. We’d watch a couple of runners approach from our right, out of the woods. They’d look at the large open stretch before them and hesitate. Almost without fail runners would wait until a sufficient number of them had grouped together, and then sprint through this gauntlet in a pack. This was the correct strategy: a single runner would have been easy pickings for the 30+ zombies milling about here. I wasn’t sure, when we arrived, whether we’d be facing Romero zombies (slow, mindless) or “28 Days Later” zombies (fast, focused). At “Run For Your Lives” we faced both types, though in truth there were probably more Romero zombies than the other kind. At the gauntlet pictured above runners had to evade both fast and slow zombies, and this made for some entertaining spectating as runners zigged, zagged, and jumped their way through the horde. As noon approached, Jonah and I went to the start location. There were well over 100 people in our wave, and the mood was extremely upbeat as we waited for the gates to open. The guy dressed as a ninja walked up and down the line of runners fist-bumping everyone. The guy behind me was wearing a Sparta mask, and indeed wore it through the entire event. Lots of jokes were made, and lots of casual encouragement was offered. We were all eager to get started. I’ve been running 5K pretty regularly for awhile now, so I was feeling pretty positive about completing this event in a reasonable time and without feeling like I over-exerted myself. Three things conspired to thwart me. First, all my jogging to date has been on basically flat ground. The course at “Run For Your Lives” covered rolling hills. Indeed, the first quarter mile of the run had us going sharply up before leveling out for a ways. The second problem to completing the race in any kind of reasonable time was the unfortunate fact that the obstacles in the track were not well suited for the volume of runners participating. This meant that runners queued up for some of them. We came to a complete stop for two obstacle. The final thing that ruined any hopes of a timely completion were the zombies themselves. I really, really, wanted to complete the race with at least one health flag. The zombies made this very, very hard to do. At the first clump of zombies, the group of people with whom I was running were all motivated and energized. We approached the zombies at speed, and essentially sprinted past them to round a corner. Around this corner were more zombies, requiring us to sprint for considerably longer than we had planned. As we cleared this batch of zombies, several of – myself included – slowed to a walk, panting hard. This proved to be the overall cadence of the event: run at a comfortable pace for a bit and maybe clear an obstacle, sprint past zombies, and then slow considerably in order to try to recover. This cadence was interrupted more than once by zombies that chased us from behind! We’d slow to catch out breath, and then hear pounding footsteps behind us. The first time this occurred, we assumed it was other runners. We were wrong. Fast-moving zombies swarmed around us before we knew what was happening, and our loose collection of runners was scattered as those with some reserve of energy sprinted on ahead, and those without lagged behind in the zombies’ reach. I lost two health flags in the first mile of the race. This made the last two miles even more stressful than I would have expected. If I had two flags, I could have taken a couple of more chances. But with a single flag, I had to really evaluate each zombie cluster to try to find an optimal path. I was, frankly, surprised by how many zombies there were. I had expected a few, here and there, scattered throughout the course. In reality, there had to have been more than 200 zombies throughout the race. They were usually clumped together in packs of ten or a dozen, but more than one section had swarms in excess of thirty zombies. These swarms were, in a word, terrifying. There was almost no hope of getting through such a swarm unscathed. As one approached a swarm there was no immediate way to tell which of the zombies would simply shamble toward you and which would actually run to intercept you. Strategy, such as it was, was further complicated by the other runners, none of whom really coordinated with one another. The zombies were also all very well done. There was a huge variety in clothing and gore. Some of the zombies were moribund, some were energetic. Some were covered in blood, some had only a pallor. The people that applied the makeup did a wonderful job, and all of the volunteer zombies performed well. It was, in all honesty, a lot of fun to run through a group of diverse zombies. The obstacles were, on the whole, fun. There were a couple of streams through which we had to run. There was one mud pit, several barrier walls we had to jump, a rope wall, and a simple maze. There was also a faux barn on the outside of which was written “Warning: Electrical Hazard”. We had to go through this structure. Inside it was dark, and there was a fog machine to further complicate things. Hanging from the ceiling were a number of live wires. Contact with any of them sent a shock to the victim. I’ve no idea how strong the shock was, thankfully, because I was able to navigate without touching any of them. There was just enough light to see the wires if you were careful, and the safety goggles I elected to wear rendered the smoke machine significantly less of a problem. The final obstacle was a set of monkey bars over a large pool of foul looking water, complete with floating entrails. This was the single biggest bottleneck in the entire event. The obstacle permitted three runners at a time, but there were well over a hundred queued up. We stood in line – in the baking sun – for at least twenty minutes as we waited our turn. I don’t know if the slowdown was due to an unexpected number of runners, or something else, but it was a bit of a downer to run through the course only to come to a complete standstill at the end. Unfortunately, neither Jonah nor I were able to complete the race alive. I lost my third and final flag somewhere just before the three-mile mark. It was a real bummer to learn that I’d lost my last flag, and it drained some of my motivation for running the rest of the race. As we approached zombies, there was no reason for me to run past them. There was no reason for me to try. I did try, at least somewhat, because I was having a good time; but I know I would have been more highly motivated at the final stretch had I retained at least one health flag. All told, “Run For Your Lives” was the best 5k I’ve run. I absolutely plan to do it again next year.